Silver Plated Splay Wine Decanter Funnel with Stand and Screen by Franmara at Verve Wine Bar. MPN: SS-FWA-9336SET-BX. Hurry! Limited time offer. Offer valid only while supplies last. This gorgeous Silver Plated Splay Wine Decanter Funnel with Stand and Screen has the finest details and highest quality you will find anywhere! This gorgeous Silver Plated Splay Wine Decanter Funnel with Stand and Screen has the finest details and highest quality you will find anywhere! Silver Plated Splay Wine Decanter Funnel with Stand and Screen is truly remarkable.Silver Plated Splay Wine Decanter Funnel with Stand and Screen Details: ; Condition: Brand New ; Item SKU: SS-FWA-9336SET-BX ; Dimensions: H: 3.75 x W: 2.62 (Inches) ; More Information: - Silver plated. 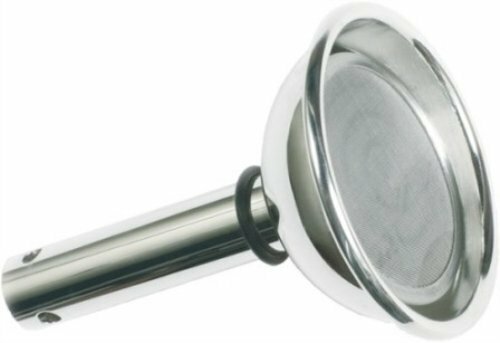 - Removable fine screen stainless steel filter with attached stem and silver plated stand (see screen filter in product number SS-G-99335). - Wine flows through three holes just above the closed bottom of the funnel. - This causes the wine to splay (spread outward) down the inside walls of the decanter. - This oxygenates the wine more, enhancing its fragrance and aroma.